Simple, secluded and incredibly pristine. 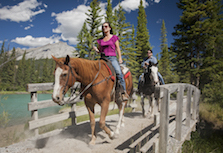 Staying at one of these campsites is the ultimate way to re-live the days of Banff’s original trail riders. But they also offer far more than just a spot to pitch a tent. Both camps are fully catered and include live-in cooks, who all love to show off their backcountry culinary skills. Gather inside the big kitchen tent to dine on succulent steak or chicken. There’s plenty of table space inside too, including room for card games when the sun goes down. 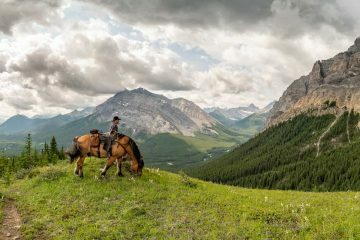 Surrounded by the limestone cliffs of summit ridges, the valley features alpine wildflower meadows and rockslides inhabited by marmots and pikas. 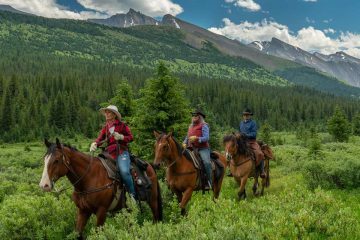 The craggy peaks of the Palliser Mountain Range provide a stunning backdrop at this wilderness camp. And when night falls, relax by the campfire while listening to the murmur of nearby Stoney Creek.